aqui para ahora: girls' day! 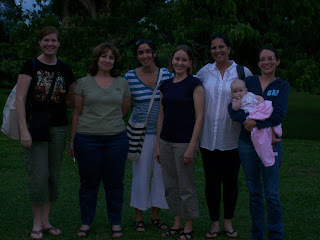 On Friday, another teacher at Colegio Bolivar, Melida, invited a few girls to her family's finca. The finca is a working farm producing sugar cane though the refinery has long been shut down; the cane is sold to one of the large sugar companies in Colombia, Manuelita. So we spent the day north of the city, enjoyed a quick tour of the family house purchased in 1910 (1920?) and all its eleven bedrooms and bathrooms - enough space to accommodate big holiday gatherings of sons and daughters, grandsons and granddaughters, and cousins. 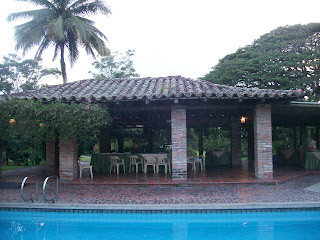 The family also rents the property for wedding celebrations. For all the little nooks and porches and balconies available, us gals just parked under a poolside pavilion and enjoyed the food, wine, and conversation. 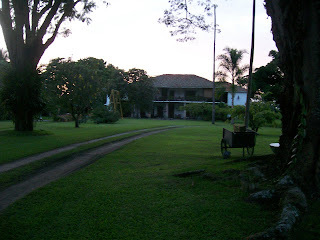 Here's the finca. When we arrived, the sun was shining and the colors were bright. But since I'm much better at taking pictures after the fact, I handed Laura Elena my camera to snap a quick one on before we left. And below, another after the fact shot of where we spent most of the afternoon. Claire and I did get a chance to take a swim. 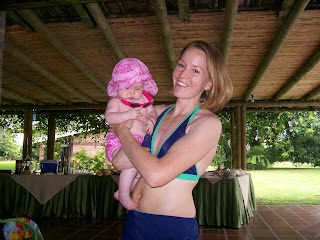 Here she is dressed for the occasion in pink swim bottoms and hat from Grandma Rollene. The sunglasses didn't last too long but I've since learned she likes playing peek-a-boo with them. And here we are in the water. Note the thumb in the mouth. Claire enjoyed kicking and paddling a bit and only took one little face-first dive. 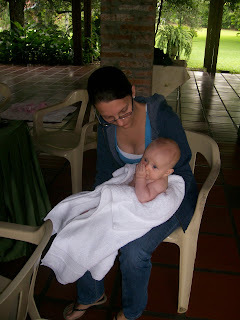 Snuggling with Melida after the swim. Claire was wired that day. She snoozed in little bits instead of a long morning and long afternoon nap. She'd lay down, fall asleep and I'd turn around to see her looking up at me. I think Claire wanted to be part of all the chatting and didn't want to sleep through any of her first big girls' day. End of the day, near dusk. We're missing a few of the girls - two left early and Sonia is snapping this picture - but we had a great day. Much needed chance to leave the city for a day and enjoy company outside of school. Looking forward to the next girls' day. aww when can i go in the pool w/my peanut?? so cute!! What a great little adventure! Truly the life less ordinary. Sounds like an amazing day. I am amazed (and jealous) of the adventurous life you are living.